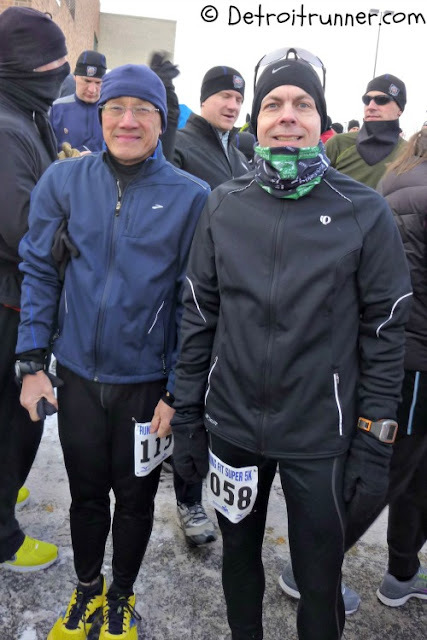 It was a cold but fun race with lots of runners. Many more people than I expected given the frigid temperatures. Overall organization was good and communication from the race staff was excellent. A great themed race to start off your Super Bowl Sunday. Great swag! Course was short according to my Garmin(3.08) which is a pet peeve of mine. Registration was very simple. 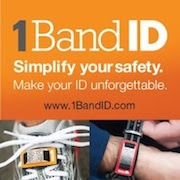 The race had a website(HERE), where you could sign up online. You could also print out a form to mail in if you wanted but I didn't decide to sign up for this race until race week. The race staff did an excellent job of communicating everything prior to the race including the new location of the race and bib numbers ahead of time. 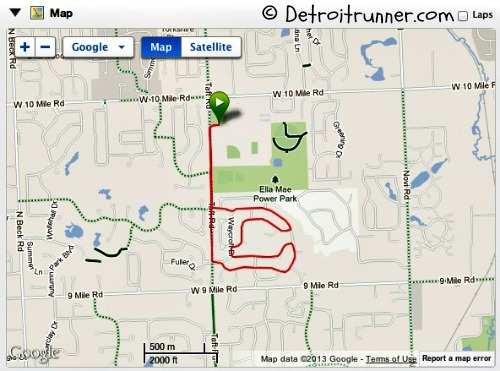 There was a new course(I never ran the old one) located at the Novi Civic Center. There were two choices for packet pickup. You could pick up the day before or the morning of. Because I am about a hour away, I opted for the morning of. We headed over to the race and got there around 8:15am and it was already getting very busy. We were able to get a parking spot no problem as there were plenty of spaces. In addition, there were several volunteers directing traffic to keep things in order. Everything was very organized from the start. There were lists of runners names with bib numbers if you didn't look up your race number prior to getting there(since they e-mailed it to everyone). In addition to race registration, which was inside thankfully, you could also remain here just prior to the race to stay warm. The temperatures were in the single digits so we were very happy to see that we cold remain inside until the race started. In addition, there was access to a bathroom here if you needed it. This was also the location of where the post party would be given it needed to be inside after the race. Did I mention it was cold? Haha! As you can see, everything was laid out quite nicely and was very easy to understand where to get your packet. The race had pins out for your bib and it was the B-tag system on the back of your bib. I'm pretty sure the majority of races now use this technology at their races. What do you know but I saw Joe, the race director for Back to the Beach half marathon, volunteering so I gave him my number and I was all set to race. There were all kinds of volunteers there helping so things went very smoothly. In fact, we didn't even have to wait most likely due to the fact they had pickup the day before as well. Volunteers at Packet Pick up! If you decided you wanted to run the race the morning you woke up, they had a table available to allow others to get in on the fun and sign up that day. The race gave no guarantees of a race beanie but given the people there(even though it was many), probably had enough for everyone that attended the race. The race had the table decorated in the football theme as you can see. One thing I like, and is a nice touch, is having a map to the start area and also of the course. While it's not something that needed for a 5k race, it was much appreciated so we could see it. It was also available online on their website but it's nice to see it at the race as you are waiting for the race to start. We had enough time to use the inside bathrooms, which was a bonus, and get a quick picture in the registration area before we started the race. The race staff made an announcement that the race would start in 20 minutes so we headed over there about 15 minutes before it started so we could stay in the warmth longer. The start area was about a five minute walk from the registration area. It was very simple to find and the race also had signs up directing runners where to go. We just followed the crowd. As we got there, you could see that there were plenty of port-o-potties there for the runners. Probably more than was actually needed but I'd prefer to see more than not enough. I took a few pictures while we were waiting. It helped take our minds off the fact that it was FREEZING outside! Haha! What are you going to do? It's February in Michigan. As you can see from above and below, there were plenty of runners for this race. It's quite popular. I guess we runners are not worried about running out in the freezing cold - well, at least the ones here. The area was packed with runners so we kind of pushed our way a bit closer to the front so we would not have to run around so many runners/walkers. We really placed ourselves perfectly considering my finishing place. Lots of runners behind us! As you can see, I've got my new Renewal by Andersen of Detroit Buff on. This thing was a life saver today and really helped keep my face warm throughout the race even though it's so thin. The course was a 5k course and this was the only option for the race - not that I wanted any further anyway. As you can see below I kept my splits pretty even throughout the race and it confirms I was in the right space since I usually am a bit slower the first mile due to running around people. Not the case today. One note was my Garmin showed the distance at 3.08 miles instead of 3.10 miles. I know it's not much but it's still very disappointing when I see that happen. I would much rather see a longer race than anything short. This is my biggest pet peeve, and I know that it's a new course but it's something that the race organizers have enough experience to make sure the course does not run short. This is especially true considering they had the room to move the start/finish back some to get the proper distance. I also confirmed with several other runners they showed a short course as well. In the end, it's only a 5k so not that big a deal. Splits - ummm, 5k=3.10 right? As you can see, the race was fairly flat except there was a small hill at about the 2.25 mile mark. Not a big deal though so don't let that stop you from running the race. The map, per Garmin, looked just like the race map we saw at registration - duh. Haha! The course started off in the parking lot of the Civic Center and then headed onto Taft road. The police had this road closed, at least at the beginning of the race, so we were free to run it and it felt safe to be there. As we got to mile one, we were in the middle of a subdivision. There was a mile marker there and the distance was spot on. So far so good. As you can see, much of the course in the subdivision, while not completely snow covered, was somewhat snowy and a bit slippery. You really needed to watch your footing as you were heading into the curves like the the one shown below. There were a few dry spots but overall you really needed to watch things carefully. The hazards to a winter race, I guess. As we got to mile two, you can see we were still in the subdivision. It was a nice area with nice homes. This is also where it got a little bit hilly but, as I mentioned, nothing to be concerned over. As we made our way back to Taft, you can see the road is back to nice and clear. I was happy to get out of the subdivision to get a little more traction on my feet. Here I am hitting mile three and the race is almost complete. There were many volunteers out on the course directing runners where to go which was great to keep things running in the right direction. There was one aid station on the course. At least in my immediate area, I didn't see many people taking the water. It was so cold and plus it was only a 5k, I think most opted to just keep running. My hats are off to the race volunteers that came out to stand there for us. It was extremely cold to just be standing there waiting for runners. This was the only aid station. While I like to see at least two aid stations in a 5k distance, I do understand in the winter time where you really can get by without any frankly so it was nice they had this one. As we came across the finish line, there were more volunteers handing out bottles of water along with the finishers glass you earned for completing the race. There were volunteers also directing runners to keep moving along and so things remained in an organized fashion at the finish line and did not get backed up. I also happen to see Larry O., as I crossed the finish line, who not only runs but does quite a bit of volunteering for races all over the place. You can see the back of his red had in the middle below. Ha! After the race, my running buddy T got a nice picture of me with my finishers glass and with that we headed back to the registration area where the food was set up for us and we could get back into the warmth. The locations of the start and registration worked out quite well considering we could drop off stuff at our car which was between the registration area and the start line. A very good set up for a race. The race had all kinds of food to eat since it was a pre Super Bowl party. The food included hot dogs, meatballs, cookies, brownies, and bananas. There was plenty of food. I passed on the hot dogs and meatballs because it was only 9:30am but they looked good and my running buddy said the meatballs were really good. I didn't see anything to drink like coffee or hot chocolate but maybe I missed where it was? I was craving a warm coffee after that cold race. 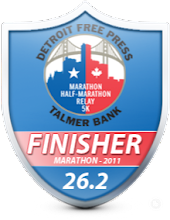 You could also see your official race time after the race here. They had a TV set up with the results but it kept resetting as the men's times came on so they changed it to just the top 5 in each age group. I wasn't anywhere close, so we didn't stick around to find our official results. 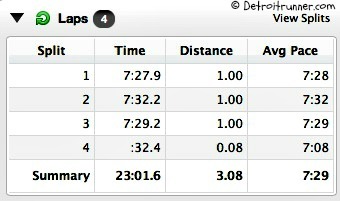 By the time I got home, results were posted on RunMichigan. 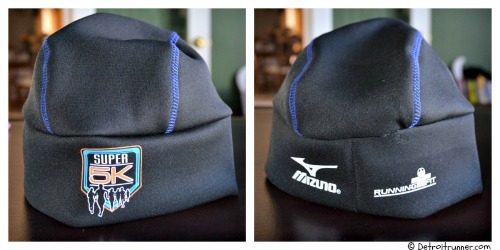 For the $29 race fee, you received an awesome tech beanie with the race logo. I thought that was a great idea since I have so many race shirts, and it was nice to have something different for a change. I even wore it for my run this morning and it worked great. This was the first race beanie I've received at a race. In addition, you received a race pin. The program Running Fit has is that you collect the pins and bring them to their last race of the year for a chance to win something. A neat idea. Also, it's the only company I have seen give out pins. I have one from last years Martian half marathon. 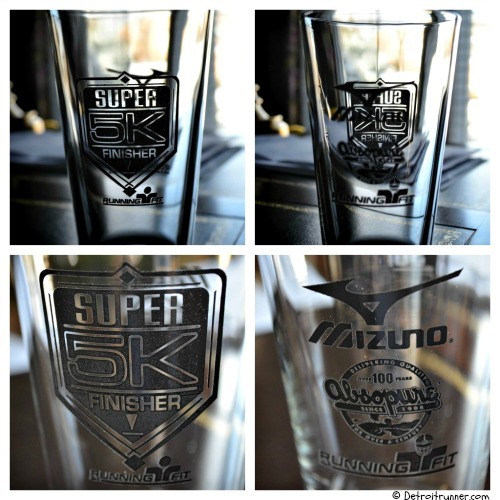 You also received a finishers glass with the race logo - it's my third glass from a race. Also, a really nice touch. Frankly, the beanie and glass were the main reason I signed up for the race to begin with and without it, I probably would not have signed up given the distance from my home. In addition, you received a safe course that was chip timed along with the food at the finish line. Overall the race organization was excellent. From email communication at the start of signing up, great directions to the race, an excellent set up for the registration area and start/finish area along with plenty of volunteers. Overall this is a race I would do again. 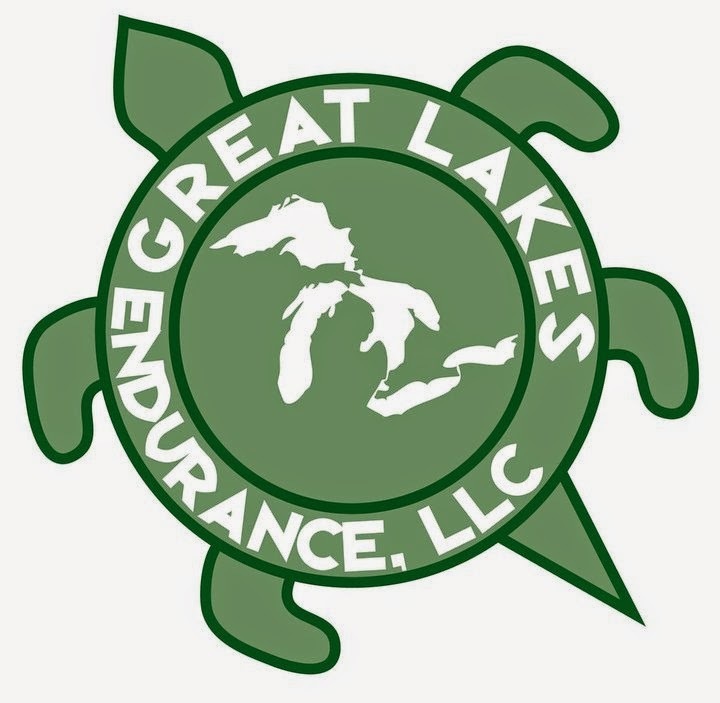 I would like to see the race organization take the steps to get the course certified so it will be the 5k distance it should be so you don't run a short course. I'll give them the benefit of the doubt this time that perhaps my Garmin was off a little but that's unlikely. With this only exception, the race was a fun winter race that allows me to not feel guilty about eating a little more during the Super Bowl. It was quite a distance from my home and I could have opted for a closer race but I loved the swag that came with the race and was very happy we took the trip to the Westside to run this. My half marathon PR by 5 minutes is on a course that my phone GPS clocked as 12.85 miles. I do not always trust my phone, but that is a quarter mile off. So I am always hesitant to believe if that is my real PR. Sounds likfe a good race and what a fun way to start out Supe Bowl Sunday. Amy. Phones are very inaccurate. If you want accuracy, a Garmin is the way to go. I realize this; I am just cheap. And I hate looking at my wrist while racing. I always do better when I run by feel. Seems like an awesome event although I don't know a thing about the Super Bowl. Big field for a 5k and indeed with the cold weather. Well done! Over on the left side of your new banner picture, there is a side view of a guys face. I'm pretty sure I'm the black hat just to the left of his face. One of MANY black hats! That was a COOOLD race. Good job!